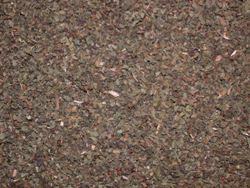 BASIL is a Sacred Herb, especially in India, where it figures in the worship of the god Vishnu. Soak it in water for three days and sprinkle the water at your doorstep to Bring Money and Success, Drive Away Evil, and have a Happy Family. To Increase Love in the Home, use it in cooking or keep some in an open bowl in the kitchen and replace it each week. Mixed in a bath with Love Herbs (such as Red Clover, Rose Buds, Catnip, Gentian, Damiana, Lavender, Cubebs, and Juniper Berries), it increases Affection in the Family. BASIL also Protects from Evil. Mix with Rosemary and Rue for a Cleansing and Protective bath. 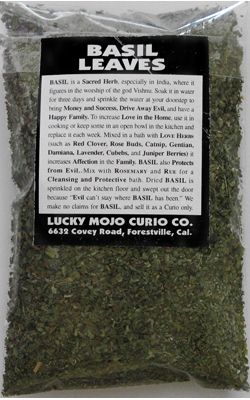 Dried BASIL is sprinkled on the kitchen floor and swept out the door because "Evil can't stay where BASIL has been." We make no claims for BASIL, and sell it as a Curio only. 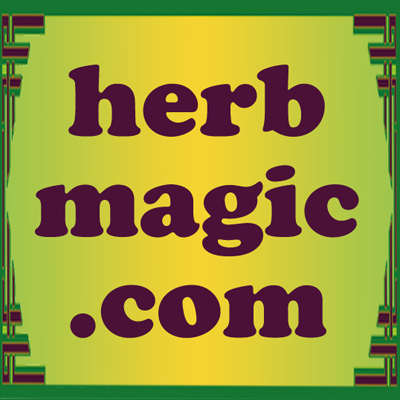 Many more folkloric magical spells utilizing BASIL can be found in the book "Hoodoo Herb and Root Magic" by catherine yronwode.